Identification, also called supervised learning or classification, is no doubt one of the most important techniques in bioinformatics. The possibility to identify unknown organisms based upon various available experiment data sets is also a big step forward realized in BioNumerics, leading to more faithful consensus identifications. 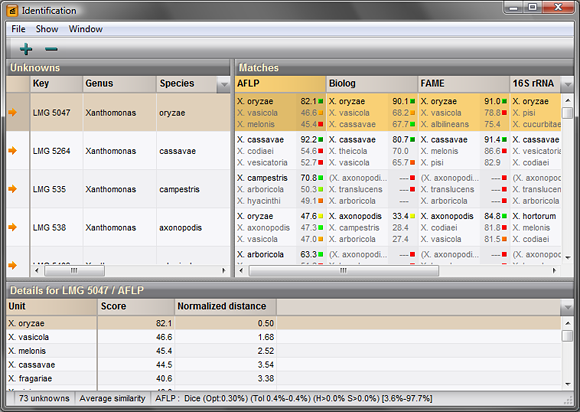 The same range of similarity and distance coefficients available for cluster analysis can be used for identification. In addition, state-of-the-art classifiers such as Naive Bayesian Classifiers and Support Vector Machines can be used. Classifiers are the algorithms that perform identification or classification, i.e. the process of assigning biological samples to classes (categories) based on a training set of which the class membership is already known. The samples are analyzed based on experimental data, which can be quantitative, binary or categorical. Creation of identification projects based on comparisons. Specific similarity measures and classifiers can be defined based on experimental data. Comprehensive identification reports showing results for each available experiment. Many different viewing options and statistical tools to facilitate interpretation.